The AAT2500 is a member of AnalogicTech's Total Power Management IC (TPMIC) product family. 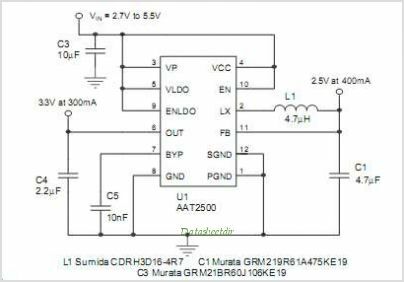 It is a low dropout (LDO) linear Regulator and a Step-down converter with an input voltage range of 2.7V to 5.5V, making it ideal for applications with single lithium-ion/polymer batteries. The LDO has an independent input and is capable of delivering up to 300mA. The linear Regulator has been designed for high-speed turn-on and turn-off performance, fast transient response, and good power supply rejection ratio (PSRR). Other features include low quiescent current and a low dropout voltage. The 400mA Step-down converter is designed to minimize external component size and cost while maintaining a low 25A no load quiescent current. Peak current mode control with internal compensation provides a stable converter with a low equivalent series resistance (ESR) ceramic output capacitor for extremely low output ripple. For maximum battery life, the Step-down converter increases to 100% duty cycle and has a typical 180mV dropout voltage at 400mA. The output voltage is either fixed or adjustable with an integrated P- and N-Channel MOSFET power stage and 1MHz switching frequency. The AAT2500 is available in a 12-pin TDFN33/STDFN33 package, and is rated over a temperature range of -40C to +85C. 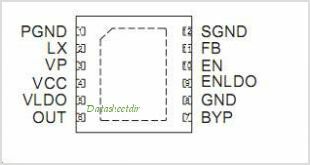 This is one package pinout of AAT2500,If you need more pinouts please download AAT2500's pdf datasheet. This is one application circuit of AAT2500,If you need more circuits,please download AAT2500's pdf datasheet.